Home / entertainment / halloween / Happy Halloween! Happy Halloween everyone! I don't know if there will be kids anywhere trick or treating, but if they are I imagine they'll be somewhere around MQ or The Wave. 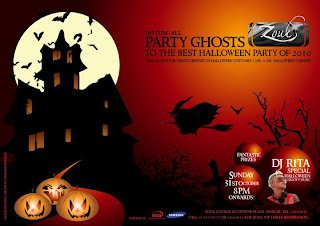 If you fancy a bit of mid-week partying, Zouk are throwing a Halloween party tonight. If you go dressed up in costume, there is no entry charge (just pay for food and drinks as you want them at the bar) and there will be prizes for the best-dressed Halloween costumes. I'm told that there will be special cocktails and shots just for tonight, and that the bar has been decorated to suit the occasion. I wonder how many ghost's in white sheets will attend? !